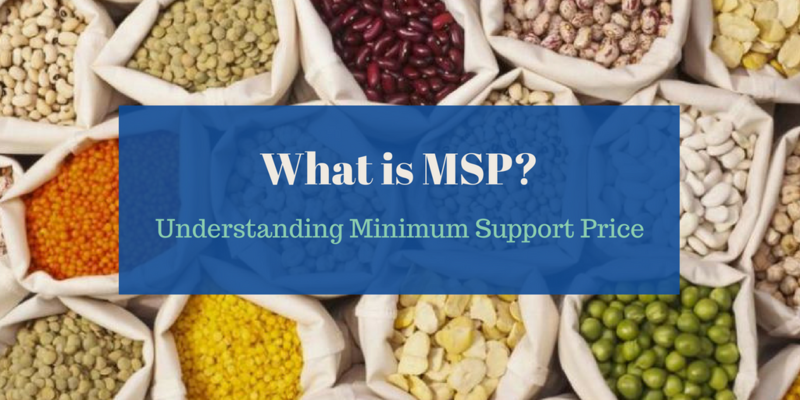 What is MSP? Understanding MSP and its impact on farmers. Why Technological Penetration for Marginal Farmers is crucial? What is Soil Health Card (SHC) Scheme? How to Procure your SHC using My Farm Info? 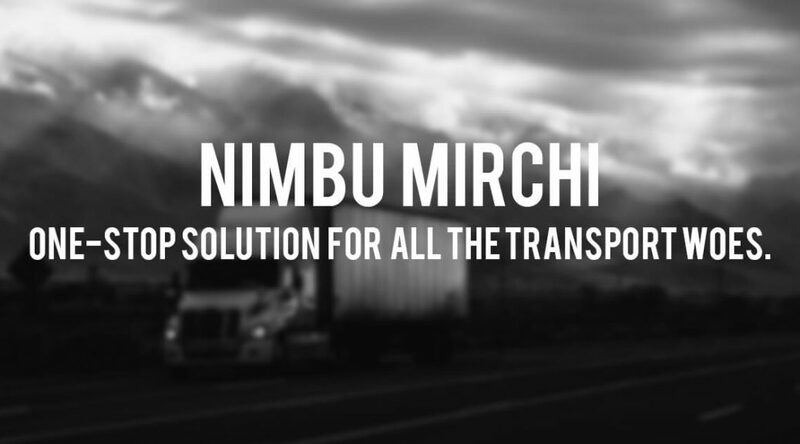 Nimbu Mirchee- One-stop solution for all the transport woes. 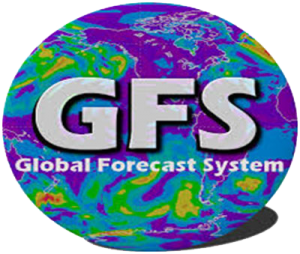 The Global Forecast System (GFS) is a global numerical weather prediction system comprising a 4-dimensional Global Data Assimilation System (GDAS) and a global dynamical forecast model run by the United States’ National Weather Service (NWS).GFS is the operational production suite of numerical weather prediction at the National Centre for Environmental Prediction (NCEP) to provide weather forecasts in short range (0-3 days), medium range (4-10 days) and partly in extended range (beyond 10 days). NCEP’s global forecasts provide deterministic and probabilistic guidance out to 16 days. The forecast model is a spectral model with an equivalent horizontal grid resolution of approximately 13 km for the first 10 days and a comparatively lower resolution of 27 km from 240 to 384 hours (16 days). In the vertical, the model has 64 layers. The GFS model is a coupled model, composed of four separate models (an atmosphere model, an ocean model, a land/soil model, and a sea ice model), which work together to provide an accurate picture of weather conditions. Changes are regularly made to the GFS model to improve its performance and forecast accuracy. It is a constantly evolving and improving weather model. Prior to January 2003, the GFS was known as the GFS Aviation (AVN) model and the GFS Medium Range Forecast (MRF) model. GFS-AVN and MRF products are a collection from NCEP’s NOAAPort. Grids, domains, run frequencies, and output frequencies have changed over the years. The model produces forecast output every hour for the first 120 hours (5 days), and three hourly for day 6 to 10 and 12 hourly from day 11 to 16. The output from the GFS is also used to produce model output statistics. The Global Data Assimilation System uses the maximum amounts of satellite and conventional observations from global sources and generates initial conditions for the global forecasts. The global data assimilation and forecasts are made four times daily at 0000, 0600, 1200 and 1800 UTC. The forecast skill generally decreases with time (as with any numerical weather prediction model) and for longer-term forecasts, only the larger scales retain significant accuracy. It is one of the predominant synoptic scale medium-range models in general use. It is our experience that the short and medium range forecasts produced by GFS are skillful and quite useful. The Climate Forecast System Version 2 (CFSv2)is a fully coupled ocean-land-atmosphere dynamical seasonal prediction system that became operational at NCEP in March 2011. The model represents the global interaction between Earth’s oceans, land, and atmosphere. The system was produced by several dozen scientists under guidance from the National Centers for Environmental Prediction.CFSv2 is the successor of the earlier version of the model named CFS version 1 (CFSv1), which became operational in August 2004. This version has upgrades to nearly all aspects of the data assimilation and forecast model components of the system. The model is used for extended range, long range, and seasonal forecasting. CFSv1 was the first quasi-global, fully coupled atmosphere-ocean-land model used at NCEP for seasonal prediction. CFSv1 was developed from four independently designed pieces of technology, namely the NCEP/DOE Global Reanalysis, which provided the atmospheric and land surface initial conditions, a global ocean data assimilation system (GODAS) operational at NCEP in 2003, which provided the ocean initial states, NCEP’s Global Forecast System (GFS) operational in 2003 which was the atmospheric model run at a lower resolution of T62L64, and the MOM3 ocean forecast model from GFDL. CFSv2 has improvements over CFSv1 in all four components mentioned above, namely the two forecast models and the two data assimilation systems. CFSv2 also has a few novelties: an upgraded four level soil model, an interactive three layer sea-ice model, and prescribed historical (i.e. rising) CO2 concentrations. But above all, CFSv2 was designed to improve consistency between the model states and the initial states produced by the data assimilation system. The atmospheric component of CFSv2 is the NCEP atmospheric GFS model with significant improvements. GFS is a global spectral model. The atmospheric model has a spectral triangular truncation of 126 waves (T126) in the horizontal (equivalent to nearly a 100 Km grid resolution) and a finite differencing in the vertical with 64 sigma-pressure hybrid layers.CFS uses the latest scientific approaches for taking in or assimilating, observations from data sources including surface observations, upper air balloon observations, aircraft observations, and satellite observations. In the operational setting, there are 4 control runs per day from the 0, 6, 12 and 18 UTC cycles of the CFS real-time data assimilation system, out to 9 months. In addition to the control run of 9 months at the 0 UTC cycle, there are 3 additional runs, out to one season. In addition to the control run of 9 months at the 6, 12 and 18 UTC cycles, there are 3 additional runs, out to 45 days. There are a total of 16 CFS runs every day, of which 4 runs go out to 9 months, 3 runs go out to 1 season and 9 runs go out to 45 days. Data sets are freely available on NCEP/CPC web site for downloads. At WRMS the gridded datasets of CFSv2, which are in GRIB2 code form are downloaded, subjected to decoding and post-processing procedures through software package developed at WRMS to extract values of several atmospheric parameters of interest, such as 2m temperature, Tmax, Tmin, mean sea level pressure, humidity, and precipitation rate. This exercise is repeated every 5th day on 1st, 6th, 11th, 16th, 21st and 26th of every month. The individual runs on each day are treated as ensemble members and ensemble averages are worked out. At the end of the last run in the month, a super-ensemble of all the days during that month is computed to obtain monthly forecasts for next nine months. The elements extracted are precipitation, max & min temperatures and humidity. The 45-day forecast daily data are used to work out pentad mean values and anomalies from model climatology. 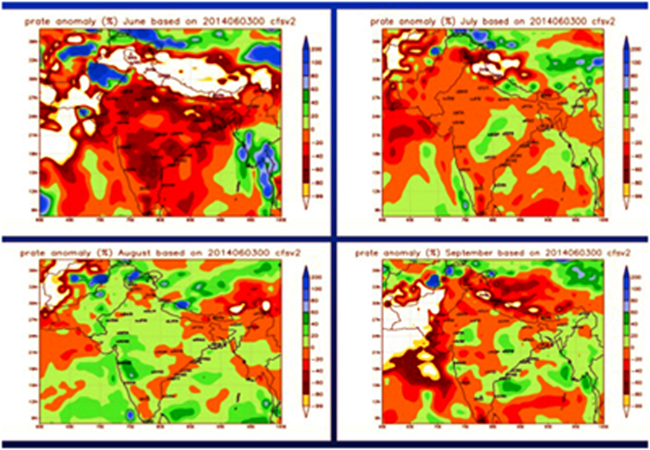 The daily time series of 45-day forecast provides a good idea of the active and break cycles in the monsoon season. Processed forecast information in graphics form is provided on WRMS website www.weatherzillla.com. Seasonal forecasts of monthly averages are updated at the end of each month; 45-day forecasts are updated every 15 days based on products dated 6th and 21st of each month. Between 2003 and 2013, there were 78 disasters caused by all types of natural hazards, including climate-related events. This number has doubled since the 1980s. In a span of ten years, it has affected close to 1.9 billion people and caused over USD 494 billion in estimated damage. The total economic damage is estimated to be $1.5 trillion. Out of this total, close to 25 percent of the economic impacts is borne by the crop, livestock, fisheries and forestry sector. The surge in climate change-related disasters poses growing threat to food security. “Small-scale farmers, fisherfolk, pastoralists and foresters – from Myanmar to Guatemala and from Vanuatu to Malawi – have seen their livelihoods eroded or erased by cyclones, droughts, floods and earthquakes,” said FAO Director-General José Graziano da Silva, 2015. According to a report from the Food and Agricultural Organisation of United Nations(FAO), agriculture is the single most affected sector by droughts, absorbing on average about 84 percent of all the economic impact. This situation is expected to worsen unless effective measures are taken to protect the agriculture sector. With the increase in population, there is immense pressure to increase food production, boost security and protect farms. When Agriculture is synonymous to disasters and risks beyond our control, it is necessary to take precautionary measures to control damage faced by farmers. A crop insurance plan assists in the stabilization of crop production and reduces the negative impact it has on the lives of the farmers. Considering the current scenario, crop insurance has become a necessity for agricultural-related issues. Each year, there are new technologies invented to help farmers get more produce from their investments. Since the new investments are risky, insurance packages help the farmer to try new technologies. The insurance companies allow farmers to get insurance covers for the new technologies such that if they fail, farmers will not get losses as the insurance company compensates them. Farmers who take crop insurance protect their crop from unforeseen setbacks. 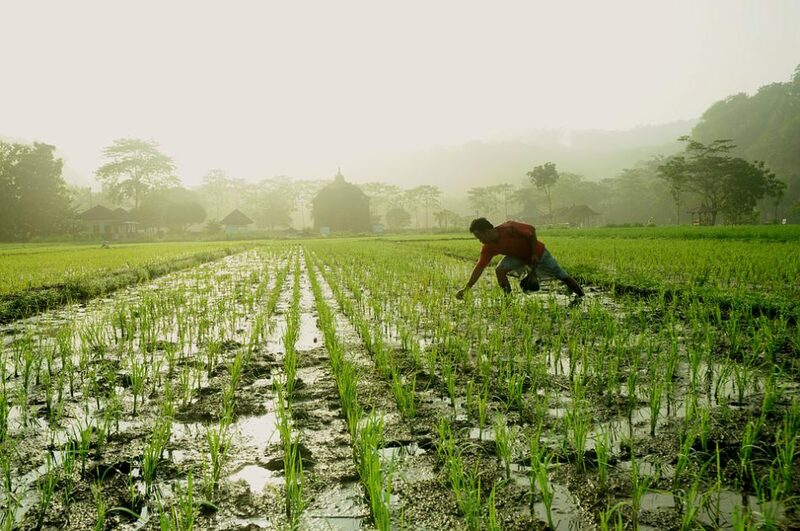 Considering that majority of the farmers livelihood is dependent on the quality and quantity of the yield they produce, crop insurance aids in fighting poverty. (i) Stability in Income: It protects the farmers against losses caused by crop failure. It acts like a tool that allows farmers to manage their yield and price risks. (ii) Minimal Debts: Farmers are able to repay their loans even during the time of crop failure with the support of the right insurance partner. (iii) Technological Advancement: Insurance companies work along with Agri platforms who use IOT to enhance agriculture practices and reduce farmers losses. This helps farmers to understand latest technological advancement and improve their crop production. (iv) Yield Protection: Crop Insurance protects farmers against production loss for crops. It also offers preventive planting and replant security. (v) Provides Awareness: Insurance companies provide awareness campaigns to help farmers understand the effect of natural calamities and also protect their farms. While a natural disaster is unpredictable, farmers can use forecast methodology to understand climate and weather change to protect their crops. Therefore, one of the most important benefit of buying agriculture insurance is that farmers get peace of mind. Since major impact of the natural disasters is on poor farmers with limited means in developing countries, it is necessary to use data, technology and financial services to solve climate related challenges. Weather Risk Management services provides insurance cover to clients ranging from Governments and large Corporate houses to poor peasants in remotest of villages. With the help of Big Data, Analytics, Smart Devices & Financial Services, we have served over 1 Million farmers and have transformed their lives. We have also saved half a million farmers who were struck by natural disaster using weather Insurance.our vision is to secure smiles for all of using pioneering new analysis, technology and innovation to provide security against climate change. A robust and intelligent Historical Data Manager contains historical weather to help farmers plan and schedule their harvest and yield. With the help of crop insurance, farmers will benefit by becoming self-sufficient. They will also be able to raise their investment in crops to get better quality produce. In India, average food consumption at present is 550 g per capita per day. With the growing population, the imminent challenge is to increase food production in order to feed the population that will reach 1.30 Billion by the year 2020. 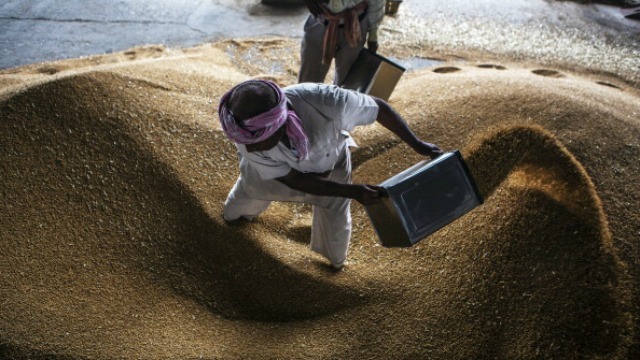 Farmers will have to produce 50% of more grains to meet the current growing demand. 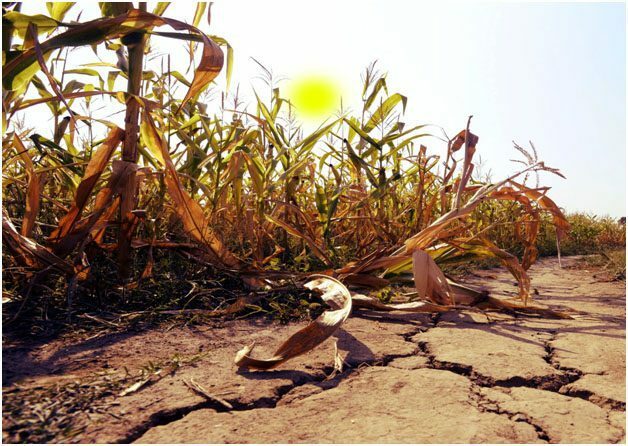 India has experienced 23 large scale droughts starting from 1891 to 2009. The frequency of droughts is only expected to increase in the coming years. 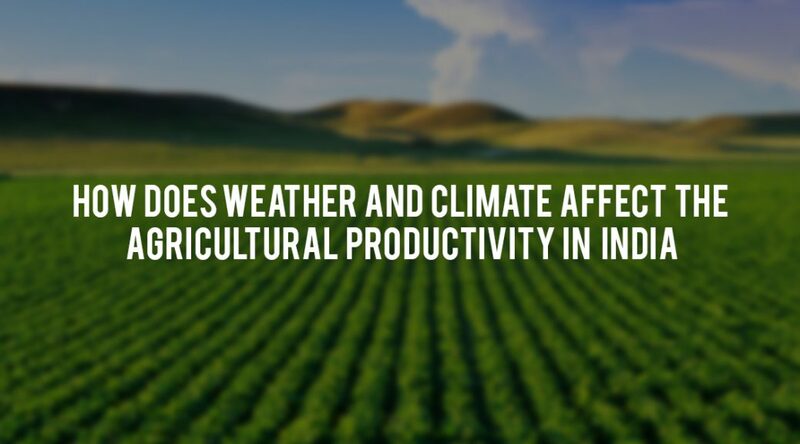 Weather and climate plays a key role in the success of any agricultural crop yield. 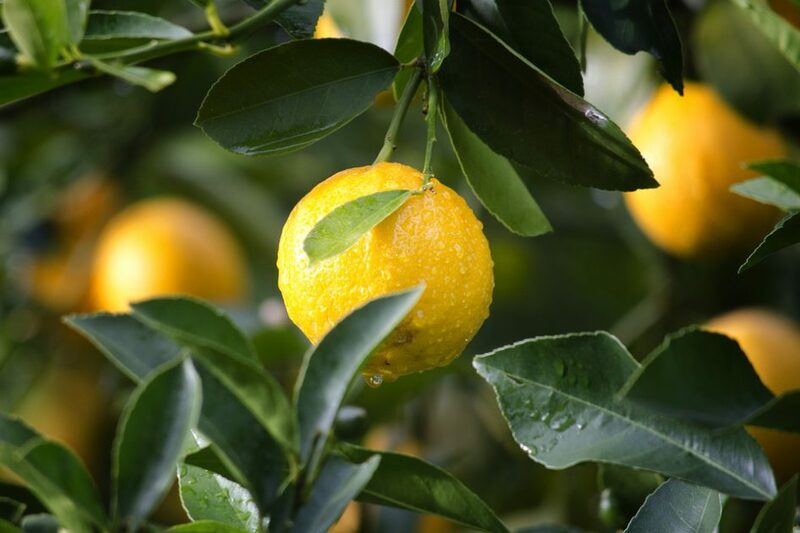 Changes in temperature, precipitation, Co2 emission etc has a direct impact in the quality and quantity of the produce. Water, the most critical agricultural input in India is scarce. Nearly 55% of the total cultivated areas in our country do not have irrigation facilities. With the increase in global warming, the longevity of heat waves across India is all set to increase with warmer night temperatures. The days are getting hotter and this trend is only expected to continue. Agricultural productivity is dependent on Co2, Temperature, Solar Radiation, Precipitation, Soil Moisture and Wind Direction. Changes in any or all of these elements has a direct impact on the crop production. So how does change in climate affect crop productivity? Excessive rain, Untimely rain, Scanty rains with lengthy dry spells, Heat and Cold waves, Storm, High wind and Floods are some of the factors to consider . Farmers are dependent on the monsoon that originates from the Indian and Arabian Sea. When the climate changes, the rainfall cycle, magnitude and the timing of rainfall is altered leaving the farmers unprepared for the change. When the temperature is warm, the water is held in the form of moisture. In arid regions, soil moisture gets evaporated fast leaving less water for crop production. The groundwater level in various areas are also affected with the change in climate. Wind travels in horizontal motion from a high-pressure area to a low-pressure area. With the variations in temperature and shift in solar radiation, air from high-pressure areas rushes to the low-pressure areas causing horizontal movement of wind. When growing plants are exposed to hot wind, it results in dwarfing due to the desiccation of plant tissue. Wind also increases the crop water requirement due to evapotranspiration and therefore an increased need for irrigation. Agricultural productivity will also be affected due to increased carbon dioxide in the atmosphere. Increase in CO2 will increase temperatures throughout the Earth. Plants will need extra water both to maintain their larger growth as well as to compensate for greater moisture evaporation as the heat increases. While rainwater is not sufficient for current agriculture farmers will have loss in crop productivity due to lack of enough water. With Internet of Things in Agriculture and Smart Farming, farmers can now increase their productivity and minimize their losses. My Farm Info is one such tool. Farmers can find the feasibility of growing any crop in their farm using this website. Through this, farmer can grow the crop which will produce maximum yield and avoid growing crops that are not feasible for their area. Forecast Advisory is also provided. With the help of such information farmers can get early warning of disease infestation so they can take proper measures to minimize their losses. Farmers can also use the crop scheduler section in this tool to keep track of all stages of their crop life cycle. SMS messages are sent to them according to the crop schedule. Even Forecast and disease alerts will notified using SMS service. 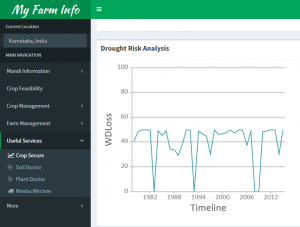 Farmers can also use the Flood and wind risk pages to find the impact of flood and wind on their produce and with such valuable information, can increase their productivity and profits. Why and How to use My Farm Info Plant Doctor? The Food and Agriculture Organization (FAO) estimates indicate that pests and diseases are responsible for about 25% of global crop losses. 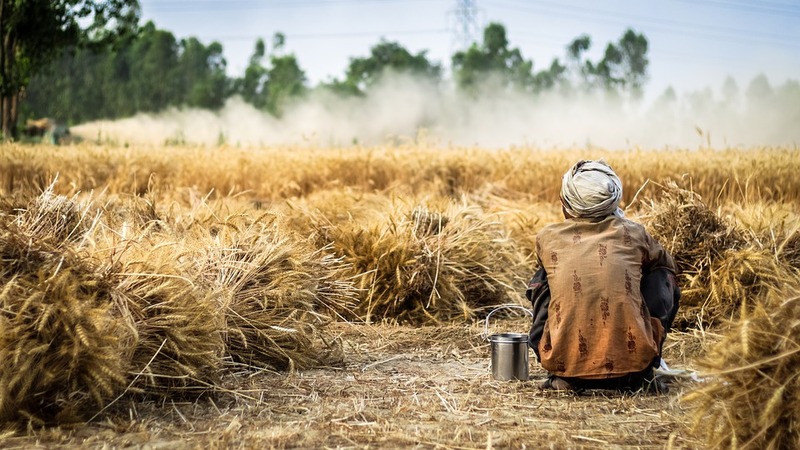 Estimates show that diseases typically reduce plant yields by 10% every year even in developed settings, this loss often exceeds 20% in less developed settings. This information places crucial impact on disease identification and immediate solution for budding crops and this is exactly where My Farm Info Plant Doctor has helped many farmers. Without proper identification of the disease in the crop and the disease-causing agent, the disease control measures can be a complete waste of time and money and may even lead to further plant losses. Farmers have resorted to using many of their own methods for disease prevention and control. This often includes using myriad number of pesticides and insecticides. This not only is an added expenditure, but at times is not sufficient enough for disease prevention. When used in excess these chemicals lead to more harm than good in the long-term. It is therefore vital to get the Proper disease diagnosis done. 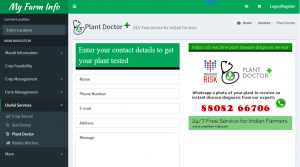 My Farm Info Plant Doctor is a 24×7 service made specially available to Indian farmers to serve this very purpose. While the science of plant pathology is continually advancing to improve disease control, and keep up with changes in diseases, plant diseases still cause major economic losses for farmers worldwide. As such keeping track of the disease symptoms along with its causal factors and cure for a everyday farmer is a tough task. Losses be it catastrophic or chronic, on average account for 42% of the production of the six most important food crops. Then there are Losses incurred due diseases which occur post-harvest. These can be disastrous, especially when farms are a long way from markets and infrastructure and supply chain practices are poor. It is here that a service like My Farm Info Plant Doctor has a crucial role to play. My Farm Info by itself is a very helpful resource towards minimizing losses and better farm practices. The Plant Doctor is something started off with the purpose that farmers get the adequate and responsive technical support they need. 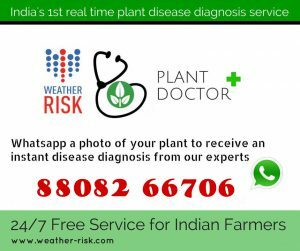 Plant Doctor is India’s first real time plant disease diagnosis service available 24/7 and Free of cost for Indian farmers. Usually farmers spend lakhs of Rupees over the years on disease management, often without adequate technical support, resulting in poor disease control, pollution and harmful results. 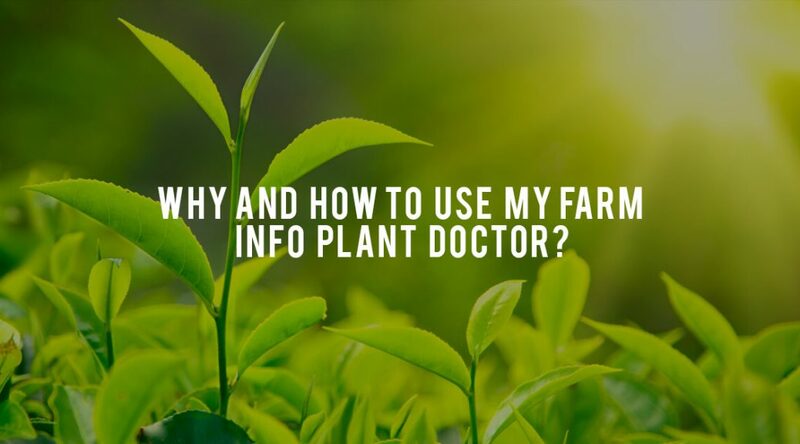 The My Farm Info Plant Doctor brings expert help within reach of every farmer at any period of time. Proceed to My Farm Info and check out Plant Doctor in the Useful Services section. To proceed right now click here. This will open up a Form like this, where you will be required to Enter details like Name, Phone Number, E-mail, Address and Message you want to convey. The My Farm Info team will then connect with you and take the process forward in earnest. From disease diagnosis and identifying causal factors to treatment and prevention all help and guidelines will be made available. This, helps the farmer taken on the disease in a targeted manner instead of the earlier arbitrary approach. Alternatively, the Indian farmers can also just click a picture of the infected plant part and Whatsapp it to- 8808266706. The service is free and available 24/7 real-time for Indian farmers. This is a very useful resource for farmers. Controlling plant diseases is crucial for reliable production of food, food security and makes agricultural use of land, water, fuel significantly efficient. Fungi: Fungi can spread long distance when their spores get transported via wind, water or they may be soil borne. Fungal diseases can be controlled via fungicides and other farming practices. But these often evolve and get resistant to fungicide being used. Powdery mildew, rot, wilting are a few examples of fungal symptoms. Viruses and Virus like Organisms: Under normal circumstances these only cause loss in overall yield. This makes it economically nonviable to control them other than in cases where they infect perennial species such as fruit trees. Nematodes: These infect the roots of the plants and parasite on the whole system. This directly affects the plant growth. Others include Protozoa, Algae & Parasitic Plants. Farmers find use of Plant Doctor to handle the disease problem very efficient and cost-effective. 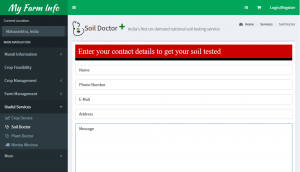 Why and how to get Soil testing services using My Farm Info Soil Doctor? India is ranked second in global farm output. India’s arable land area of 394.6 million acres is the second largest in the world. Its gross irrigated crop area of 215.6 million acres is the largest in the world. Still we are way behind in adapting technology and making our practices sustainable. Much of the role here is played by condition of the soil. Be it due to rampant use of chemical fertilizers and ill-advised use of pesticides or just common erosion, the soil undergoes a lot of changes. Not knowing about the health and condition of your soil can incur unnecessary costs and also not deliver the expected production. Hence, soil testing and diagnosis are considered important aspect of productive and sustainable farming. Now, with MyFarmInfo Soil Doctor farmers can procure the benefits of on-demand nation-wide soil testing service. Nutrient content: Plants require multiple nutrients to grow. Minor nutrients: iron, manganese, copper, zinc, boron, molybdenum, chlorine. Soil tests determines the nutrient content of the soil sample and thus allow us to make better decision in terms of adding the nutrient substitutes which are lacking. Composition: Soil composition determines its characteristics and behavior. A soil with more sandy content behaves very differently than a soil with high amount of fine soil particles. Study of composition allows for getting an insight into soil behavior and thus help make better decision about crop selection. Acidity or pH level: pH level indicated the acidity levels of the soil. A pH range of 6-7 is considered neutral or normal and good for cultivation. But blatant use of chemicals can alter the pH range. pH level below 6 indicates acidic soil and pH level above 7 indicates alkaline soil both of these conditions are unsuitable for cultivation. Moisture content: Knowing the moisture content allows for farmers to better plan their irrigation methods. Knowledge of moisture content also allows for better crop selection. Fertility: This determines the expected soil growth potential and indicates nutrient deficiencies, potential toxicities that may be present due to excessive fertility and any inhibitions from the non-essential trace minerals. Frequent soil testing aids farmers to decide whether their current farm management is robbing them of future productivity and profits. When combined with local calibration data, soil testing is the best guide for determining nutrient needs for crops. Soil testing as a tool to provide balanced fertility program is a vital component for sustainable farming that is profitable, efficient yet environmentally responsible. Head over to MyFarmInfo.com and check the Useful Services section. To head over right now click My Farm Info Soil Doctor. This will open up a form. Fill up this form to avail benefits of My Farm Info Soil Doctor. Enter your Name, Phone Number, E-mail, Address and your Message and the My Farm Info team will connect with you. It is as easy as that. A soil sample will be collected and tested upon completion of which a detailed report will be generated. This report will highlight all the factors and give a status of the soil’s health. The standard way to go about soil testing has also changed with the advancement i n technology. Now with the services of global positioning system (GPS) easily available to anyone, farmers can be smarter about how they conduct soil tests. Soil constantly undergoes change. As biological and chemical processes in the soil break down or combine compounds, its chemistry changes over time. These processes experience a change once the soil is removed from its natural ecosystem and environment. Thus, if the soil is analyzed soon after its extraction( usually within a time-period of 24 hrs), the accuracy of chemical composition analysis is a lot better. In case of apparent delay, the chemical changes in the soil can be slowed by freezing it during storage and transportation. The right time to take soil samples is in rhythm with the crop rotation. Its best to carry regular tests to compare fields and pick out trends over time. Previously, soil samples were taken almost at random across a field, mixed together, and sent to the lab. Now, with GPS capabilities, grid sampling has become the more favored technique. Soil sampling during the process of soil testing is the foundation for understanding the variation in yield potential across a field and improve efficiency. 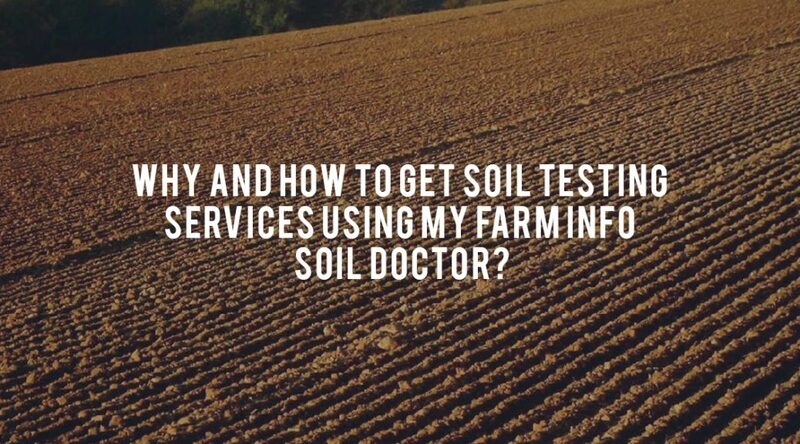 So get comfortable with Soil Testing and connect with My Farm Info Soil Doctor for help anytime on-demand. At present, there are over 7 billion people living on earth, which is expected to be 9.6 billion by the year 2050. If all these figures hold good, then the overall food production needs to increase at a rapid pace in relatively short time period for meeting the demand to feed the world’s population. However, there is good news that the advanced digital technologies available today are making it possible for collecting and leveraging large amounts of critical and pivotal data at reduced costs—hence making the operations of farm’s field insight-driven, and possibly more efficient and productive. The agriculture ecosystem has already started investing in such digital technologies. The market size for the digital-based services is anticipated to rise at a CAGR of 12.2% between 2014-2020, reaching about $4.55 billion. The enhanced use of digital agriculture services is crucial to not just for improving the performance of the farm financially, but also for meeting the food requirement of the growing population. For being successful, a farm should grow to the max per acre as it could, reducing the chances of crop failure, minimising the operating costs, and selling crops at the best possible price. All of this requires, together with several other things, managing the input resources effectively like water, fertilizer and seed quality and reducing the effect of unpredictable variables like weather and pests. Though, attaining this feat is not easy. Traditional methods such as physical crop inspection is a time-consuming one and could also be erroneous, while tractor-mounted and fixed sensors alone won’t offer a real-time image of what is happening in the field. The farmers are facing additional challenges in interpreting this information into operational insights which could assist them in understanding what actions to take, where and when. It is where Digital Agriculture Service comes into play. By producing comprehensive insights into operations, it helps farmers to make data-based informed operational decisions for optimizing yield and boosting revenue while reducing expenses, the risks of crop failure, and overall environmental impact. Depending on the crop, the Digital Agriculture Service could help improve the overall profitability by $60 to $110 each acre. This Digital Agriculture Service combines real-time data from several sources, including NDVI images from UAVs, environmental sensors in the field, sensors mounted on the field equipment, soil databases and weather forecast data. By merging telemetry from such diverse sources and leveraging the decision support engine coded with the crop-specific rules of the business, Digital Agricultural Service could offer recommended actions for the farmers to take for improving the economic output from their farms. Digital Agriculture Service could be connected to farm’s work management system that allows the platform in automatically scheduling the appropriate machinery when the farmers accept definite recommendations. BY PRODUCING COMPREHENSIVE INSIGHTS, FARMERS COULD MAKE OPERATIONAL DECISIONS BASED ON DATA WHICH WOULD OPTIMIZE YIELD AND INCREASE REVENUE WHILE REDUCING EXPENSES AND THE RISKS OF CROP FAILURE. Most of the farms globally—predominantly those located in the emerging markets are relatively small, involving few acres alone. These small farmers follow conventional farming practices since they lack knowledge about the existing modern practices. Residing in the remote areas, struggling in nurturing crops on their small plots, these farmers overuse the macro fertilizers and neglect the advantage which they could get from the micro-fertilizers suitable for their soil and crops. These farmers also lack understanding of the pest life cycles, and hence frequently experience crop failure when an avoidable infestation or infection occurs. That’s where digital technologies like Internet of Things (IoT) together with the big data analytics and visualization capabilities can help farmers in gathering and cross-correlating a wide range of critical data for making timely and meaningful operating decisions which could enhance their yield and ultimately the profitability. Intended particularly for smallholder farmers, these solutions could enable the agro-input providers for helping farmers improve their yields by providing pesticide, fertilizer, and seed advice tailored for a farmer’s land and requirements. Improving the agricultural yield is an age-old challenge for farmers and will continue to be. Though, today, digital technologies are allowing farmers in achieving a quantum jump forward in their overall performance. 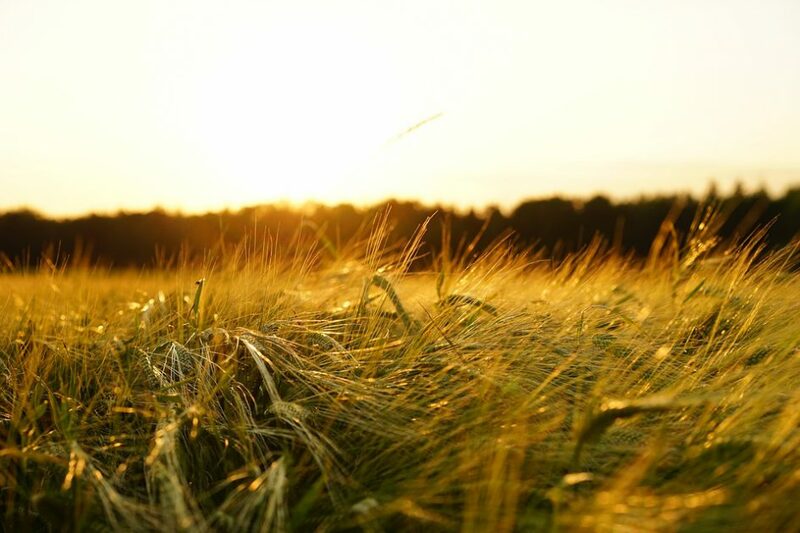 While increasing the yield is good for the profitability of the farm, it’s also gradually important for addressing the rising food demand among the ever-increasing population. Pair this with the lower environmental effect because of minimal water wastage, CO2 emissions, and chemical run-off, and one could see the crucial role digital technologies has to play in fostering maintainable farming practices. This is why it’s imperative for each and every participant involved in the agriculture biome to embrace innovative and emerging digital technologies for making their overall operations more productive, profitable and efficient. 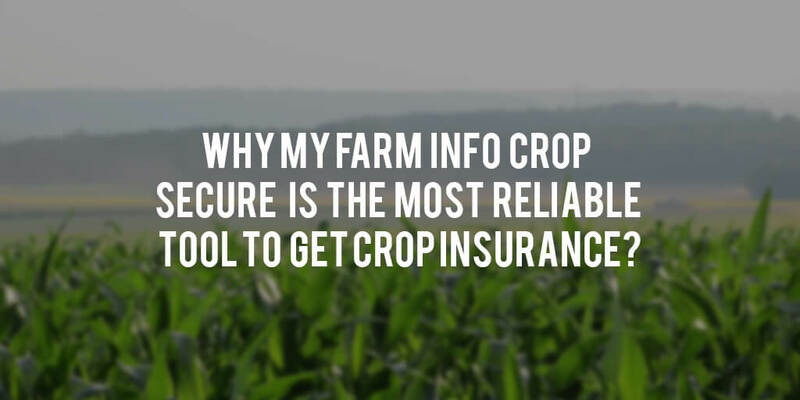 Why My Farm Info Crop Secure is the most reliable tool to get crop insurance? India ranks second in global farm output. 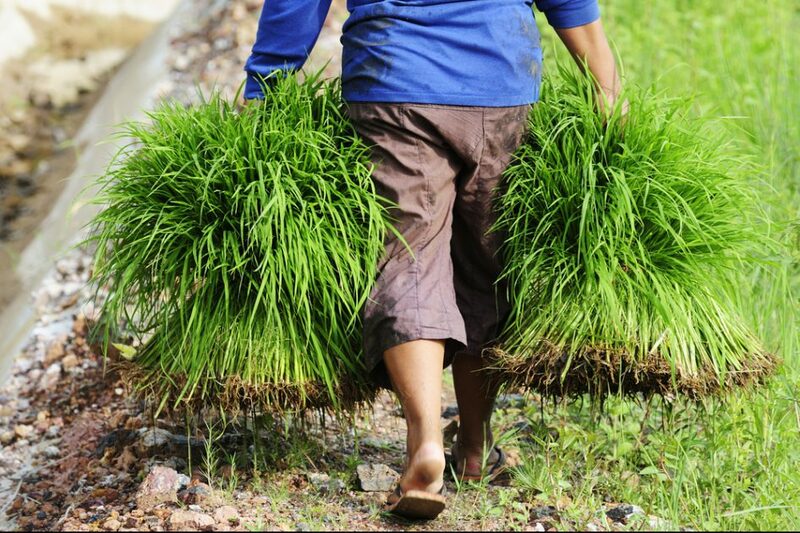 IBEF states that over 58% of the rural households are dependent on agriculture as their main source of livelihood. But pests and diseases account for 15-25 % loss in production each year. Bad weather has always been known to cause widespread damage. This puts the Indian farmer at peril and it always makes sense to get the crops secure by getting an insurance. But do the farmers have the right knowledge and guidance to go forth with the decision? With the open platform at My Farm Info farmers can now access all kinds if information. From weather forecasts to soil understanding everything is available in a few clicks. The Crop Secure feature just requires you to mark your farm and lays out the complete insurance plan along with probability of risks. Thanks to the superb satellite support and advanced sciences. Every year pests and diseases destroy around one-fourth of total crop production. At a time when India needs to shore up its production and ensure nutrition for its increasing population, pests and diseases pose a risk to food security. Farmers end up using a lot of chemical pesticides in order to curb these diseases. This increases the costs and also adversely affect the soil. The same process can be made tremendously cost-effective if the disease can be specifically known and the respective pesticide is used. The same goes for the pests. Farmers spray a multitude of insecticides or wrong insecticides which increases the cost and may not necessarily stop the pests. Studying the area and the crop the pest risk can be estimated and preventive measures can thus be taken. Using My Farm Info Crop Secure allows the farmer to get the data immediately. They need to Geo-tag their farms and choose the crop which will be used for production. The service then delivers all the data about the diseases and pests. 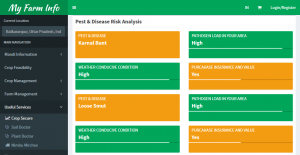 It also lays down the pest risk analysis and disease risk analysis. Using this information the farmers can be prepared. They can also easily look up information about the insurance if they would like to take it. The details, right from the premium, avg. 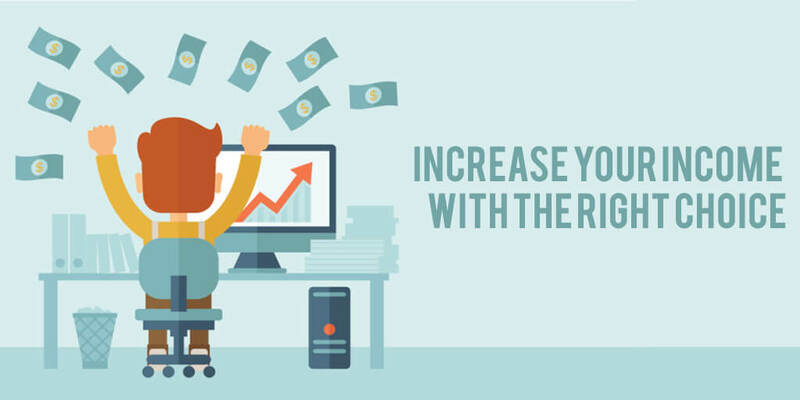 payoff, etc are all readily available in a single click. Last year in October, excess rainfall in Marathwada in Maharashtra saw epic losses due to excess rainfall. Excess rain destroyed Soyabean crop worth Rs. 2500 crore in the area. This is also the very area which sees huge number of farmer suicides. Using modern technology, weather stations installed across the country and satellite imaging the climatic conditions can be predicted to the toe. My Farm Info is an open website which showcases these details. The Crop Secure feature gives an year-on-year analysis and also allows you to insure against the risk for the same. Many a times even after having an insurance a farmer ends up struggling to prove that the crop was indeed destroyed by rains. This is where this service comes into focus. 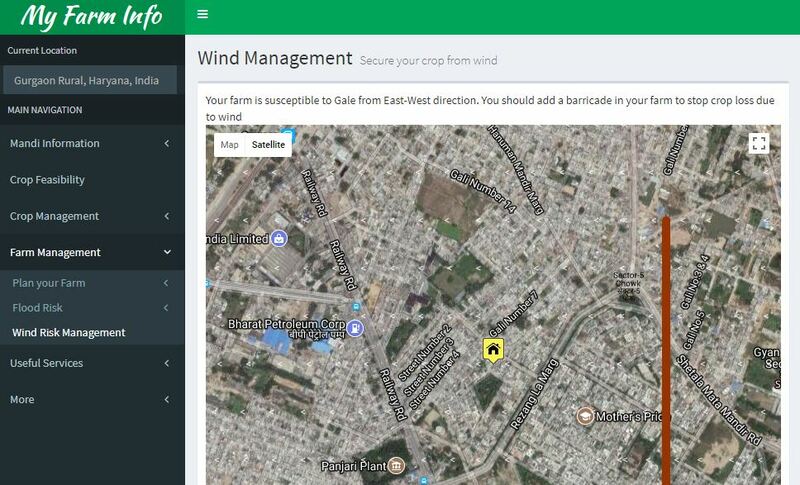 The My Farm Info allows the farmer to source the data to prove the claims in such a scenario. Thus making Crop Secure a very beneficial service indeed. 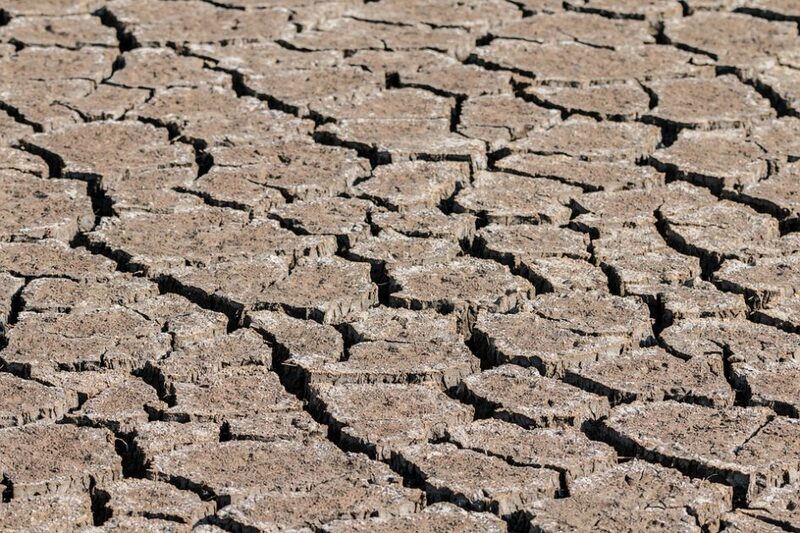 Apart from the rains, another weather factor which can cause havoc are droughts. The Crop Secure feature allows the farmer to specifically get the previous record for their geographical area. It allows for options to be secured by providing insurance against this Risk. Crop Secure also provides details of the loss caused by excess heat. 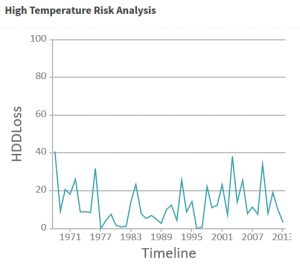 Excessive heat along with droughts have a deadly effect when it comes to production losses. The general method is to use a smartphone app and physically tag the farm by covering its boundary. On My Farm Info you can also do the same virtually by use of Google Maps. Enter the Name of your City or State in the Search Bar. The Google Map brings you to the location accordingly. Zoom in and Navigate the area until you find your Farm. Now, use the marking tool in the map and start marking the borders of your farm. Every successive mark draws a straight line, the last mark must coincide with the first mark to complete the process and thus provide the enclosed farm area. For using Crop Secure, first click here. Now Geo-tag the farm as mentioned above. After that choose the crop that you have raised in the farm. Once this is done, the service will load the data for your farm according to soil, weather, etc and give you an analysis report. This report allows the farmer to know about the farm and get crop security by getting an insurance. Wire.in stated that ‘To give stagnant agricultural growth a boost, a shift must be made from concentrating on the country’s food security to focusing on the farmers’ income security.’ NITI Aayog plan to double the farmer’s income by 2022 stressed upon the focus on irrigation and quality seeds. Farmers in many parts of India are largely dependent on factors such as rainfall for their harvest and it has a huge impact on their profits. With uncertainties around rainfall, it has been a constant battle with nature to produce quality yields in a good quantity that will help their income and survival. Experienced farmers used farming history and their expertise to battle this uncertainty. They were able to predict what plant will grow and how much of water was needed based on the weather condition to continue farming successfully. Generations of farmers have followed this wisdom that has been passed on to them. What they were not prepared for was the climatic change global warming and the effect it has on farming. IOT has started transforming the agriculture industry and helping farmers to improve their crops productivity and yield. Simple factors such as knowing the soil type, when to farm, understanding weather and rainfall forecast, being ready to manage pests with preventive measures can lead to a profitable year of harvest. When one of these factors is overlooked, farmers suffer failed harvest. A tool like My Farm Info helps farmers understand their farm better. MyFarmInfo.com is an agriculture information system to help farmer maximize their income by providing them ways to increase their yield and help them get the best price for their produce. Farmers can input their farm details in this software tool on top of GIS interface and enter their farm details.They can look at the farm layout and locate it online using this tool. They will able be able to add new farms and get a complete report on how to improve their farm income by getting optimum NPK application, nutrition information and optimal mandi for the crop. Scheduling is an important aspect of crop production. Accurate schedules are required to grow crops to marketable size at the right time of year. Poor scheduling may cause growers to experience less productive yield. There are several factors that can influence crop productivity. To successfully schedule a crop, farmers have to work backward from the day they would like to market their crop and then decide on the date of seed sowing. WIth the help of My Farm Info tool, it is possible to keep track of all stages of crop life cycle. Farmers will receive messages according to the schedule regarding their upcoming crop stages. Forecast and disease alerts will also be sent through SMS. Another important factor that affects crop productivity is the risk of the farm getting flooded. This could be because of rainfall or due to improper irrigation management. My farm info helps in checking if the farm is susceptible to floods using 10 years of historical data. Farmers with that knowledge can work on preventive measures and reduce the chance of flooding. Another external factor that could affect the crops is wind. Exposure of growing plants to wind results in dwarfing due to desiccation of plant tissue and will thereby reduce its growth. The wind also increases crop water requirements. The Wind Risk page in My Farm Info helps farmers to find the impact of flood and the wind on their produce. Agricultural industry is fast growing and will always have changes. There will also be a set of risks for the produce. Farmers who want to be successful have to be willing to change, adopt to technology and move to smart farming than age old traditional practice. 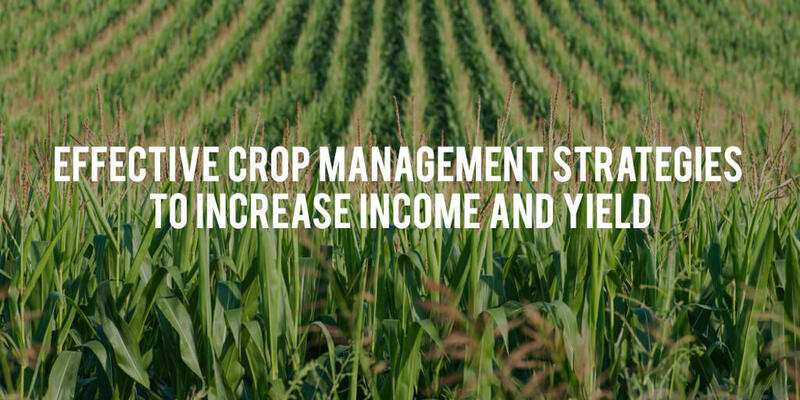 Effective Crop Management Strategies to Increase Income and Yield. India loses 15-25 per cent potential crop output due to pests, weeds, and diseases. Harvest and post-harvest loss of India’s major agricultural produce are estimated at Rs 92,651 crore ($13 billion), according to data published by the ministry of food processing industries on August 9, 2016. The numbers have gotten far worse this year. In February 2017, an ICAR scientist stated that pests eat away 35% of total crop yield. Such large-scale crop loss has an adverse effect on biosafety with the increasing demand due to population growth. The European Union has banned the import of Indian mangoes as they failed to pass its stringent biosecurity regulations. P.K. Chakrabarty, Assistant Director General of the Indian Council of Agricultural Research stated that among all the pests, nematodes, the microscopic parasite had recently emerged as a major threat to crops in India and has caused an estimated loss of 60 million tonnes of crops every year. Crop protection and crop enhancement solutions are readily available and it is a matter of creating awareness to farmers and village authorities and implementing these solutions in a systematic manner. With the advancement of Internet of Things(IoT) in agriculture, there are tools that can help farmers identify and prevent pests in their crops. My Farm info is one such tool. In the Farm Management section of this tool, farmers can save their farm details by drawing their farm on top of GIS interface. Once the information is fed into the system by the farmer, Once we have this information, the tool will provide the farmer with optimum NPK application, nutrition information and optimal mandi for the crop. In the Crop Feasibility section of this tool, farmers can find the feasibility of growing any crop on their farm. When this is done at the early stage, farmers can decide which crop is the best to grow that will produce maximum yield. He will also be able to avoid growing crops that are not feasible for his area. The tool also has a Crop Management section. Farmers can find the probability of disease infestation in their crop. This scientific tool uses sophisticated algorithms in concurrence with the last 10-year historical data to find disease probability for the farmer’s crop. Forecast Advisory can be used by the farmer to get early warning of disease infestation so they can take proper measures to minimize loss. The tool also tells the farmer the right pesticide to use and in what quantity.Farmers can now protect their fields and seek the fruits of their yields without worrying about precision. Some of the farmers are not aware of the right quantity of pesticide their crop would require. In such cases, too much of pesticides are applied that leads to the produce being poisonous for human consumption. My Farm Info provides pest and disease vulnerability across 34 crops. By knowing this in advance, farmers are able to take preventive measure to protect their crops. It is also possible for farmers to get in touch with My Farm Info for contact spraying by sharing their contact details. Once this information is shared, My Farm Info gets in touch with the local dealers and provides the necessary pesticide. Nutrient Management is one of the key factors in the quality and yield potential of a crop. The application of nutrients, timing, soil management, and water management are important factors in crop quality. Farmers can also use the ‘crop scheduler’ section in the My Farm Info tool to keep track of all stages of crop life cycle. They will receive messages (SMS) according to the schedule regarding upcoming crop stages. Forecast and disease alerts will also be sent through SMS. Other information that will be available is the best season, best crop suitable for the season and soil factor, irrigation timings and schedules and more. WIth all these information, farmers are able to make informed decisions on managing their crop. The tool also helps in weed management. While there are some weeds that do not affect crop growth, there are other which are distinctly destructive. It is difficult to know the destructive weed every time. The tool provides different weed information along with pictures for farmers to know what is growing on their farm. List of names and pictures of weeds for up to 18 crops can be found on My Farm Info. For farmers who are growing vegetables, this tool also provides nematode management and advisory. Water is one of the key factors in crop health and with effective water management solution such as timely irrigation information from experts via SMS and WhatsApp, getting expert advice has been made easy. These experts from My Farm Info are also called as Health Doctors whose primary concern is the health of the farm. The ultimate objective is to help farmers increase their yield and income and that can be achieved by using a tool like My Farm Info. The agricultural landscape in India is fast changing. Internet of Things (IoT) has been growing exponentially in India and not only does IoT have a big impact in the Healthcare, Automotive, Technology, Retail and Travel industries but also in the field of Agriculture. With features that enable smart farming, better pest control, remote sensors, soil moisture measurements, crop cycle management and improved reach and connectivity through SMS and WhatsApp, farmers have been able to increase their yield, reduce waste and gain higher profits. Despite the advancement of technology for better agriculture, the bulk of Indian farmers continue to sell their crop to village-level dealers and produce aggregators. In the olden days and the age old practice still continue with majority of farmers in India – farmers offload their produce to local dealers aka middlemen who decide on the price. These dealers would then mark up the price and sell it to consumers or other retail stores. In such deals, farmers get the short end of the stick. Majority of the farmers do not take their crop to mandis or to government agencies or cooperatives where they could get a better price. Agriculture market in India for selling crops is fragmented and this fragmentation hinders free flow of agri commodities from one market area to another. Multiple handlers are the ones who make fat profits while the consumers pay a steep price without a corresponding benefit to the farmer. In 2016, the National Sample Survey Office (NSSO) released ‘Some Aspects of Farming in India’ report which showed that almost 85 per cent of coconut growers sell their produce to retailers and dealers in their immediate neighbourhood instead of approaching mandis. Out of other crops such as paddy, wheat, jowar etc, nearly 50 percent were sold through retailers and dealers as well. Based on the government initiative, all states in the country except three of them have the mandate to market and sell the farm produce through mandis owned by individual states and or to retail markets without the need of a middleman. There are 6,746 such mandis and each one is located at a gap of 462 km. The government also aims to set up a wholesale market at every 80 km. Most states have agreed to implement the new model Act proposed by the government. It is believed that this implementation will help in doubling farmers’ income by 2022. “We aim to promote healthy competition by breaking down the existing monopolies of traders and middlemen,” said Ashok Dalwai, additional secretary at the agriculture ministry. With the ability to sell to mandis that would fetch better prices for the crop, the next challenge would be to find out how? Where does a farmer go and how does he know if he is getting a better deal in one mandi and not the other. My Farm Info, a software tool allows farmers to check different mandi prices in real time. Farmers can also look for mandis near them to sell their crops. With a listing of over 39 nearby showing the distance in kilometers and prices for each crop, farmers can choose the best mandi based on the distance and cost that is suitable for them to sell their crop. The price for selling at the Mandi’s will fetch 15-20% more than what the farmers can get by selling their crop to the middlemen and village-level dealers. My Farm Info not only helps farmers to sell their crops for a better price, but also work with the farmers in helping them better the quality and quantity of their yield. 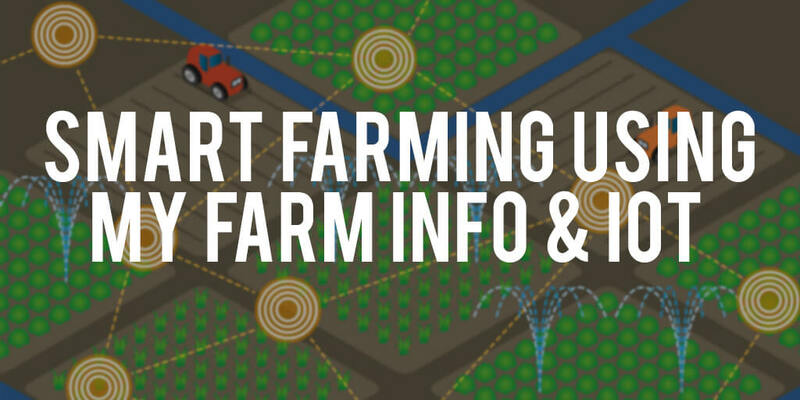 My farm info uses Internet of Things to prevent and mitigate crop losses for Farmer, Insurance Companies, and Government Stakeholders. With MyFarm info, farmers can begin to see results in such short time and by using this platform, they are able to reap benefits within the same season. The crop management section in this tool helps farmers find the probability of disease infestation in their crop ahead of time. Sophisticated algorithms are used from the last 10 years of historical data to find disease probability for farmer’s crop. Forecast Advisory can also be used by farmers to get early warning of disease infestation so they can take proper measures to minimize their losses. Working with the potato farmers in West Bengal, My Farm Info was able to increase farmer’s revenue by Rs 130 per day. Potato farmers in West Bengal’s key struggle have been to deliver potatoes based on the quality requirement set by Pepsico and therefore face a high rejection rate.Their potato produce was greenish in color, high in water and sugar content and the reason for poor quality of the produce is because of improper irrigation management that leads to sub-optimal yields. By monitoring soil, water retention, weather forecasts, pests etc, MyFarm Info helped potato farmers in increasing the quality and quantity of their production.